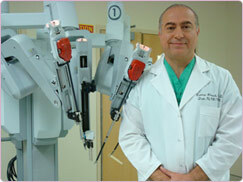 Robotically Assisted Gynecologic Surgery at Trinitas Regional Medical Center. We seek to provide the highest level of care through our highly skilled health care professionals and state of the art technologies. Our New Jersey gynecologists are devoted to addressing the individual needs and demands of patients in a warm and caring environment. Our highly trained and skilled New Jersey OB/GYN doctors, midwives and staff provide individualized compassionate health care from adolescence to menopause. We provide obstetrical, gynecological and cosmetic services. We pride ourselves in providing the most up to date state of the art cutting edge technology and techniques, emphasizing on minimally invasive surgery. We are the first to perform Robotically Assisted Gynecologic Surgery at Trinitas Reginal Medical Center. Our professional New Jersey gynecologists serve Newark, Linden, and Elizabeth.